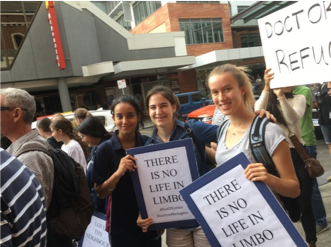 On the 25 of March I along with 8 of my peers, Mrs Coelho and and Ms Thomas participated in the Palm Sunday Walk for Justice for Refugees at St Georges Cathedral. For all of us it was a whole new experience and deeply affected us all. At the start we had many speakers including Dr Carmen Lawrence Former Premier of WA, Rev Kay Goldsworthy Anglican Archbishop of Perth. 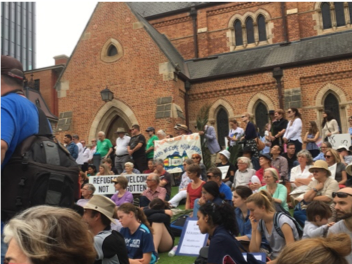 We learnt about the crisis in Nauru, how Australia is treating these refugees and how the government is doing nothing about this.We then preceded on the march along the Hay and Murray Street Malls, while chanting, holding signs and listened to stories of some of the hardships experienced by refugees. Some of the people were holding palms as they are a symbol of peace which is something we want for the refugees! Currently in Year 10 Religious Education we are learning about Social Justice and how it is everyone’s responsibility to stand up and help. This was an honestly amazing experience to see how we can put what we learnt in the classroom into action. We also witnessed people of all faiths walking in solidarity to fight for the refugees who are our neighbours. This was such wonderful experience and a great way to start Holy Week. I would like to thank Ms Thomas for the opportunity to experience this and Mrs Coelho for accompanying us, to my fellow peers who made this is such a great experience and to those organised this event.